League of Space Pirates | OUTLAWS. SCOUNDRELS. ROCK STARS. 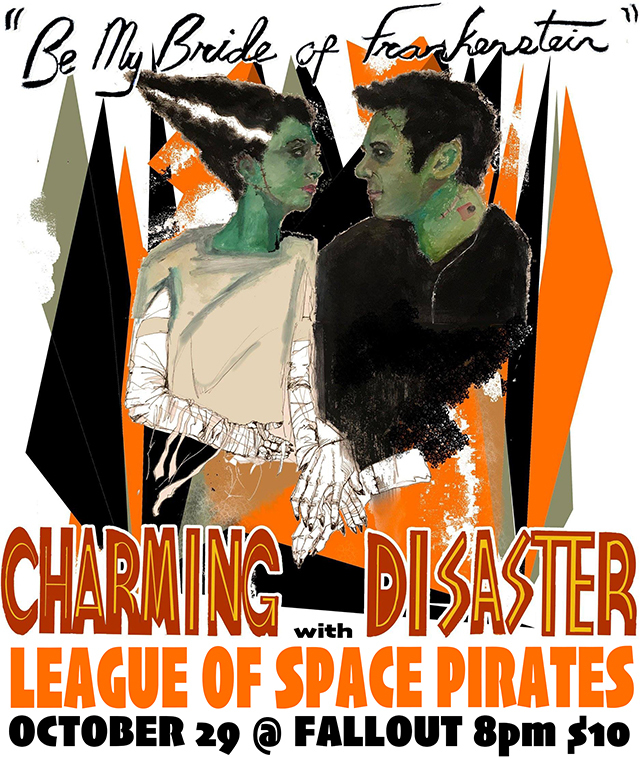 League of Space Pirates & Charming Disaster Monday October 29th FALLOUT 117 N. 18th St. RVA 8pm Doors/Music at 9pm $6 In Advance (+$2 service fee)/ $10 At The Door (cash only) GET ADVANCE TICKETS HERE Charming Disaster is a songwriting and performance duo based in Brooklyn, NY, formed in 2012 by Ellia Bisker (of Sweet Soubrette and Funkrust Brass Band) and Jeff Morris (of Kotorino). Inspired by the gothic humor of Edward Gorey and Tim Burton, the noir storytelling of Raymond Chandler, the murder ballads of the Americana tradition, and the dramatic flair of the cabaret, they write songs that tell stories, exploring themes like love, death, crime, ancient mythology, and the paranormal—exploring the various kinds of trouble a couple of people can get into with a ukulele and a guitar. 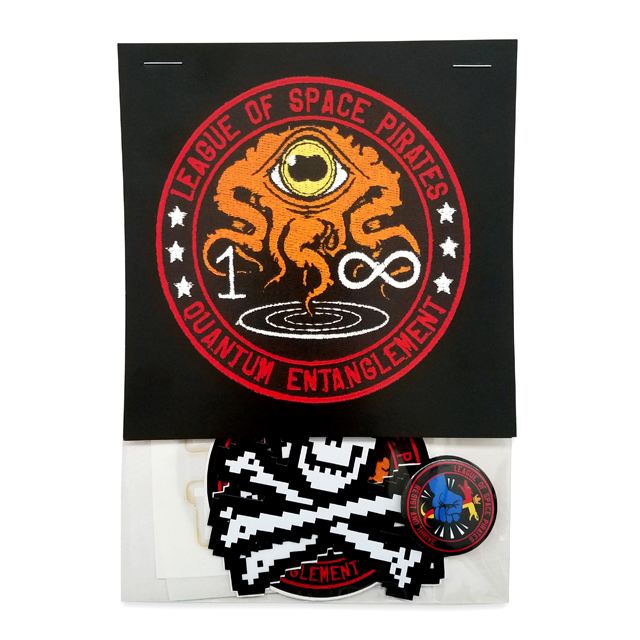 League of Space Pirates is a band of rock-n-roll outlaws from the future who kick out the jams while fighting the evil Übercorp. Led by Captain Orlok and his gang of assorted thieves, scoundrels, and robots, the League plays high-energy 25th century rock-n-roll in the name of saving the universe. They provide the very latest in multivalent entertainment: incorporating music, costumes, and comedy while broadcasting from their tourship and making periodic stops at their favorite rest stop — planet Earth. The brainchild of artist Noah Scalin, League of Space Pirates is a collaborative science-fiction universe that manifests in a range of media, including live performances, Internet broadcasts, music releases, comic books and more. We'll have a spooky photobooth, costume contests with prizes, games, demos, vendors, and LIVE music from League of Space Pirates, The Embalmers, and Alchemy's Muse! Intermission Beer Company will also provide beer, which will be poured and sold to benefit the Hanover Humane Society. And it wouldn't be a RED VEIN event without scary creatures roaming about. As dusk creeps up, we'll close out Spring-o-Ween by welcoming in Walpurgisnacht with a bonfire and dancing... part of German folklore that translates to "Witches Night." Truly letting us know that Halloween is only 6 months away! Please be aware... there is no age limit, but parental discretion is advised. Admission is free for children 10 and under. 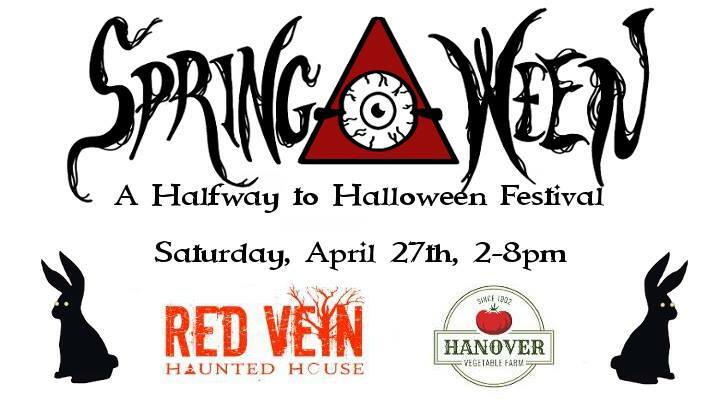 Intermission Beer Company will be providing drinks, poured and sold to benefit the Hanover Humane Society, a great local non-profit. Our latest Quantum Entanglement EP is now available in a unique new Fun Pak format! @ClaudiaB1992 Glad to have you be a part of our pirate crew!